Title: Coming north past the depot at Utica. Title: Heading north towards Mt. Vernon as it passes through Utica. Title: Flying rat gets out of the way. Title: More 38s heading south. Description: CSXT Southbound Local Freight Train A735 ( Birmingham to Talladega, Al. Turn ) passing through 27th Street Interlocking in Birmingham, Al. on their way to interchange with EARY in Talladega, Al. 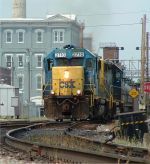 Description: CSXT Southbound local Freight Train A735-29 (Birmingham, AL. to Talladega Turn) passing through 14th Street Interlocking in Birmingham, AL. Description: CSX 365,272,7819,2710 heading south by Breese rd.